Buying a pedal that offers multiple exciting sounds and finding that you can’t save any of them is frustrating. Consistently re-creating onstage all of its cool effects is virtually impossible, forcing some players to buy multiple identical units, each set for a single sound. Fortunately, Electro-Harmonix–purveyors of some of the coolest sounds ever–introduced its first programmable pedal a few years ago. Since then, they have been churning out amazing effects, like Ring Thing and POG2, capable of a wide range of usable tones, storable as nine presets. 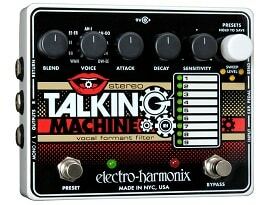 The latest addition is the Stereo Talking Machine, a vocal formant filter that offers wah, auto-wah, envelope filter, and talk box effects. The Stereo Talking Machine (STM) comes in a small, solid-metal casing packed with six knobs and two footswitches. 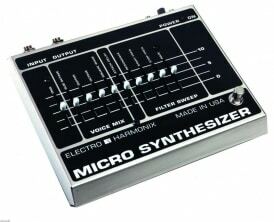 Mono audio and expression pedal (not included) inputs are provided, as well as true stereo outputs. The pedal also has an effects send and return, allowing you to add one of your other pedals (delay, distortion) between the STM’s preamp and filter sections without altering the crucial input dynamics. Left to right, the first knob blends in the amount of effect, while the second chooses the type of filtering. The third and fourth handle attack and decay, much like on a synthesizer. The fifth knob determines the direction of the sweep (for a wah, it would be either “wah” or “aow”); it also controls the sensitivity to match your pick attack and pickup power. Finally, turning the white Presets Encoder knob scrolls through the presets. Pressing and holding it for three seconds saves a preset; and quickly pressing and releasing toggles the Auxiliary functions on and off. 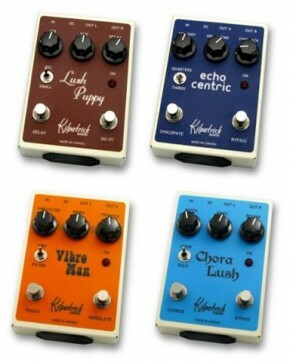 Yes, the first five knobs all have additional tone-shaping functions. In Auxiliary mode, Attack adds legendary E-H fuzz, bringing out the overtones of the various filters. Fuzz can add volume, so the Blend knob becomes a volume control. Delay and Sensitivity now control the pedal’s LFO rate and depth/waveform shape. The left footswitch steps through the programs or, when held down, engages the Auxiliary controls. The right switch bypasses the effect. Plugging in to the STM, I found that the Wah voice sounded funktastic, whether in envelope mode or operated with an expression pedal. Guitarists have long since discovered that EHX’s Bass Balls’ double filtering is not just for bassists’ and how much cooler it is to be able to sweep it with a pedal! Initially, I thought seven vocal formant settings might be a bit much for such a specialized effect. A little fiddling with the attack, decay, and blend knobs revealed that subtler versions of each voice added an amazing array of expressive options to R&B rhythms, LFO-ed arpeggios, and soaring rock solos. More extremely vocal versions helped put the “fun” into “funk”. Talk box sounds have been around since Frampton came alive and Joe Walsh decided that life was good so far. More recently, vocal formant sounds have been dished up by the likes of Chromeo. The STM let me bring a more vowel-like dimension to my sound, imbued with subtle and varied “AH” and “OW-EE” hues, and I didn’t have to place a tooth-rattling tube in my mouth. Ultimately, I found myself discovering sound after sound, suitable for stage and studio use. Fortunately, with the Auxiliary mode I can store two sounds in each slot for a total of 18. The Stereo Talking Machine takes its rightful place alongside my other EHX programmable effects. Between the manual and auto-wah effects and the astonishingly realistic vocal formants, it offers a huge box of unusual, speech-like colors with which to tell my musical stories. Electro-Harmonix also sent a set of .010 EHX guitar strings that I immediately checked out on my 1965 Fender Stratocaster (the strings are also available in .009 and .011 gauges). 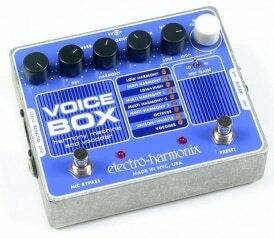 Anyone familiar with EHX effects knows they don’t sound like any others on the market. Likewise, EHX strings don’t sound or feel quite like any other strings I have tried. Consider this: most new guitars sound “new,” while only a few boutique manufacturers have managed to make their new guitars feel and sound “played-in.” Similarly, when I put a new set of strings on, it takes a few hours of playing before a certain edginess disappears from the tone and the glossy feeling fades from under my fingers. EHX has created a combination of a pure nickel wrap with specially selected stainless steel that goes on fresh, already sounding and feeling like a played-in set: no nastiness in the high end and a smooth feel that facilitates the sliding into notes that is an essential part of my style. which Nascar track gives a guitar to the tace winner?